I have held blue suckers. A bunch of them. Tuberculate blue sucker. They are incredibly cool looking fish. Wisconsin River, May, 2013. 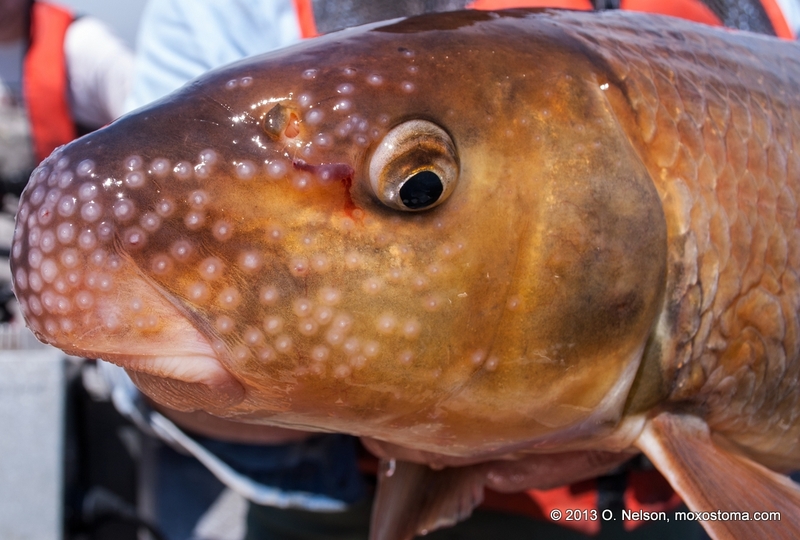 It turns out that if you start a site devoted to catostomids, and you’re very polite to the right people, you might find yourself spending a sunny May day on board a boat in the Wisconsin River with a net in your hands and hundreds of suckers (of many species) and sturgeon (of two species) surfacing all around. Wisconsin DNR research scientist and fish expert John Lyons invited me to join him and his crew on a DNR electrofishing (shocking) boat as they stunned blue suckers (Cycleptus elongatus) and shovelnose sturgeon (Scaphirhynchus platorynchus), measured and weighed them, checked for existing PIT tags, and tagged those that had none. In several hours we covered about 3 miles of river and pulled in 2 lake sturgeon (Acipenser fulvescens), 39 shovelnose and 17 blue suckers (9 female, 8 male). Almost all of the blue suckers had completed their spawning efforts for the year. To many of us who choose to fish for little-known and seldom-seen species, the blue sucker is a holy grail. As befits grails and objects of quests, they are difficult to find and rarely caught on hook and line. Even among all the roughfishing experts who frequent roughfish.com, only two or three have done it. Just to taunt us, every year a few are caught (and/or snagged) by walleye anglers since walleye are also bottom-feeders. The problem for would-be blue sucker anglers is that blue suckers are at home in fast, deep water. Getting a bait to the bottom in such locations, let alone getting it to stay there long enough for a blue to find it, requires a lot of weight. Unfortunately, that weight also means it is difficult to feel a subtle bite if it happens. 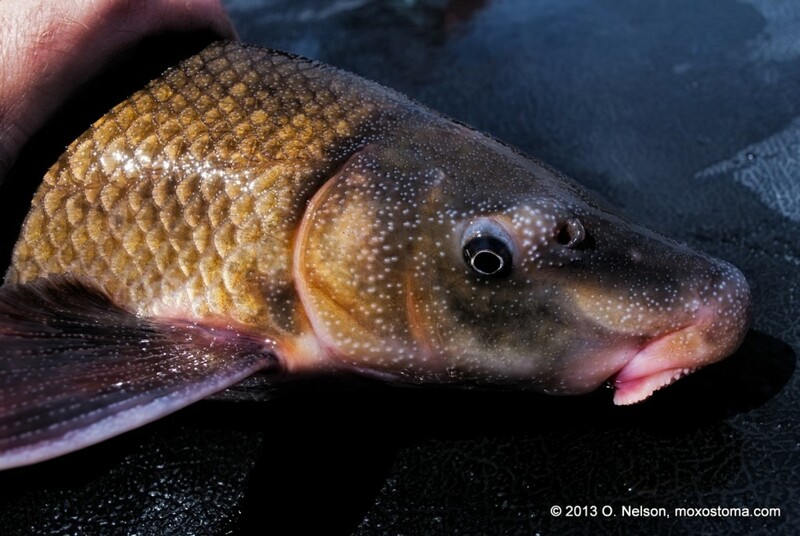 The blue sucker is listed as threatened in Wisconsin (see the WI DNR blue sucker page for information and photos). Its range has been massively curtailed by the march of “progress”: dams, dredging, pollution, silt, reduced flow, warmer water, and other side effects of our presence. Those same factors make life and reproduction difficult for the shovelnose and lake sturgeon, but there is a glimmer of hope. Lyons explained that the sampling we did (and which he and his crews do periodically in the same area) is part of a project aimed at better understanding the biology—age and growth, seasonal movements, habitat use, and timing and locations of spawning—of shovelnose and lake sturgeon, paddlefish, and blue suckers in the Wisconsin River. The plan is to build a serious fish passage to let fish get around the Prairie du Sac dam. This will make it possible for paddlefish, shovelnose, and blue suckers to re-establish themselves above the dam and it will allow lake sturgeon access to prime spawning habitat above the dam. Information gained in advance of such a major project should help make sure it is designed and operated as effectively as possible. Lyons believes that both blue sucker and shovelnose sturgeon populations are stable in the Wisconsin River, which is good news. If they can get a passage built around the dam and the fish actually use it, the news will only get better and better. I’m no fan of dams, and I’d prefer to see them all gone. That said, I know it’s not going to happen and I’m glad when states realize that they have an obligation to do something to reduce the negative impact of dams as much as possible. A final note on my first experience electrofishing: it was awesome. There was a time when I didn’t know how many interesting species were swimming around with the bass, pike and trout I fished for. Then I found out that suckers, bowfin, gar and other rough fish were literally all around me. It was a revelation. In the years since, I’ve become comfortable in the idea that I have a good sense of what the water holds, even if I can’t see it. In other words, I was ripe for another revelation. Standing in the middle of the electrofishing boat gripping a 10 foot long net handle, trying desperately not to miss blue suckers or sturgeon, I watched literally hundreds upon hundreds of fish surface, some floating still as if dead and others launching themselves out of the water like miniature silver carp. In addition to the sturgeon and blues we were after, there were shorthead, golden and silver redhorses (and at least one river redhorse), quillback (and possibly some river and/or highfin) carpsuckers, smallmouth (and possibly bigmouth and/or black) buffalo surfacing all around me. There were also a few walleyes, smallmouth bass, mooneyes, and one large, beautiful paddlefish. Sometimes there would be a couple dozen fish within a few feet of me—fish I would have had no idea were there in such numbers if I’d been fishing. I learned, again, that we generally have no accurate sense of what is below the surface. The number of suckers I saw that day without even trying was much greater than the total number of suckers I’ve seen in my life. It may have approached the total number I’ve seen in photos in books and online. It is a useful revelation in at least two ways. First, I have a better sense of how many unseen targets are out there for me as an angler. Second, an excuse has been removed from my arsenal. 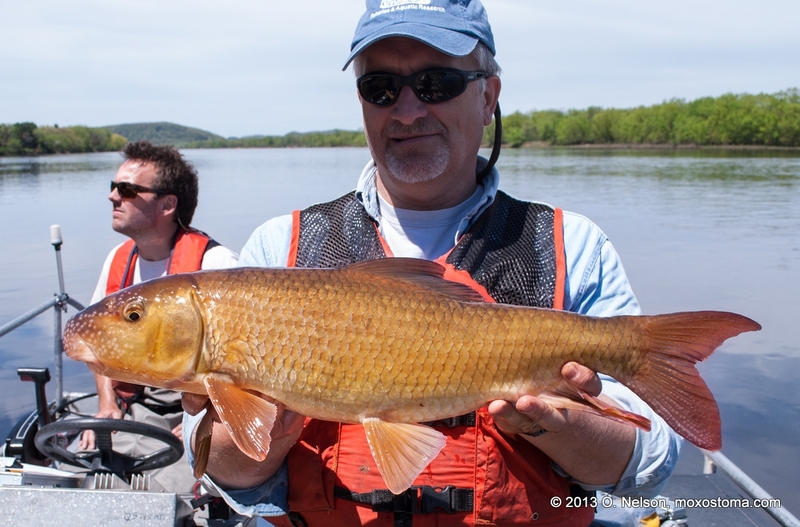 I can’t as easily fish a big, healthy river like the Wisconsin and blame failure to catch fish on an absence of fish. I will have to admit to myself much more quickly than I might want to that I am probably doing something wrong. Many thanks to John Lyons, Aaron Nolan, and Dan Walchak for letting me tag along. Now, some photos. I didn’t take as many as I should have. It means I’ll have to convince them to let me join them again, and next time I’ll keep a camera close at hand the whole time. 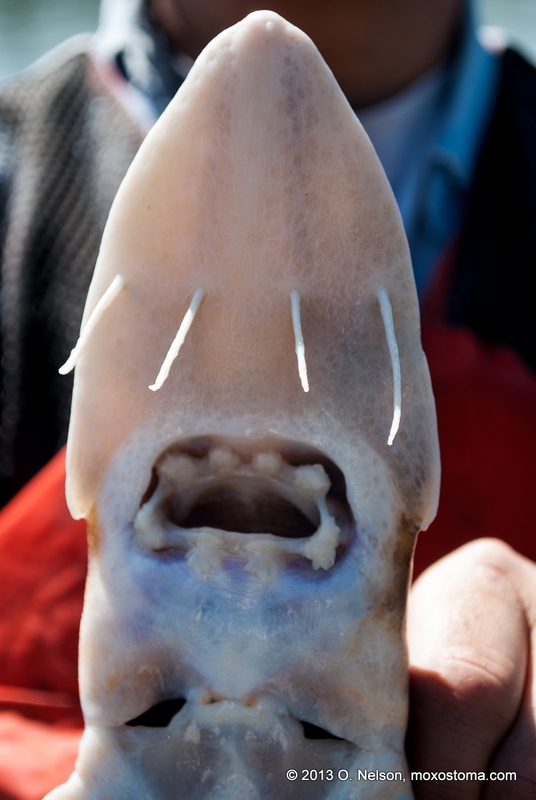 Blue sucker (cycleptus elongatus) held by John Lyons. This is the only full body shot I took all day. Blue sucker (cycleptus elongatus) lips. The definition of papillose. 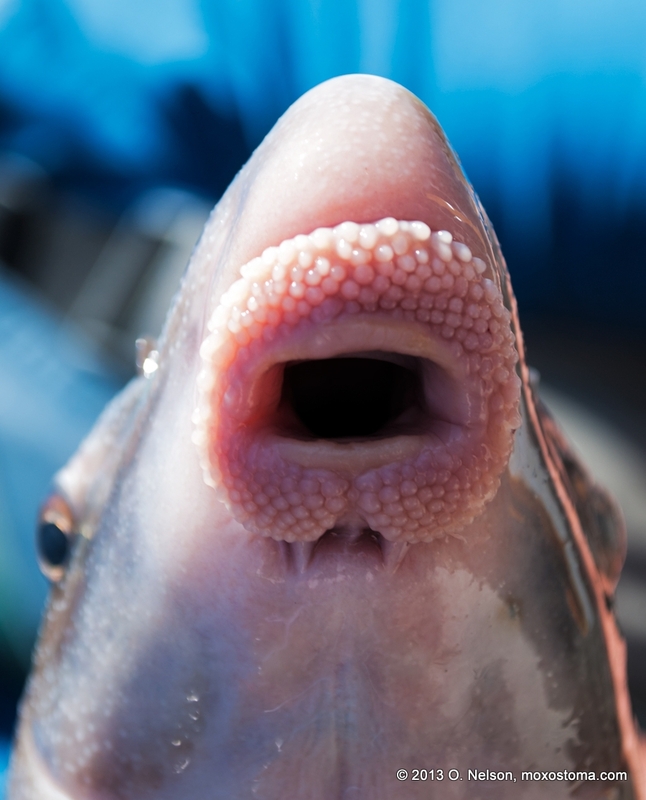 Blue sucker (cycleptus elongatus) lips. I got to act for a minute like I’d caught this 35-40 lb. 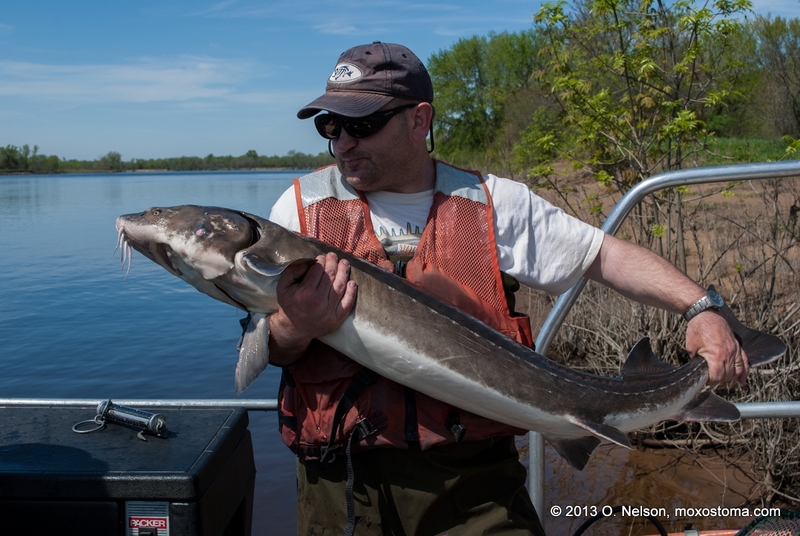 lake sturgeon netted during electrofishing on the Wisconsin River, May, 2013. 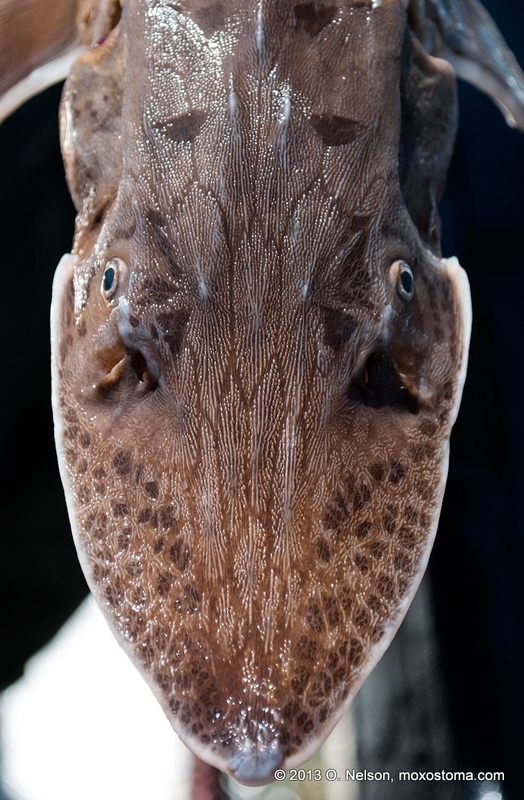 Shovelnose sturgeon, top view. Wisconsin River, May, 2013. 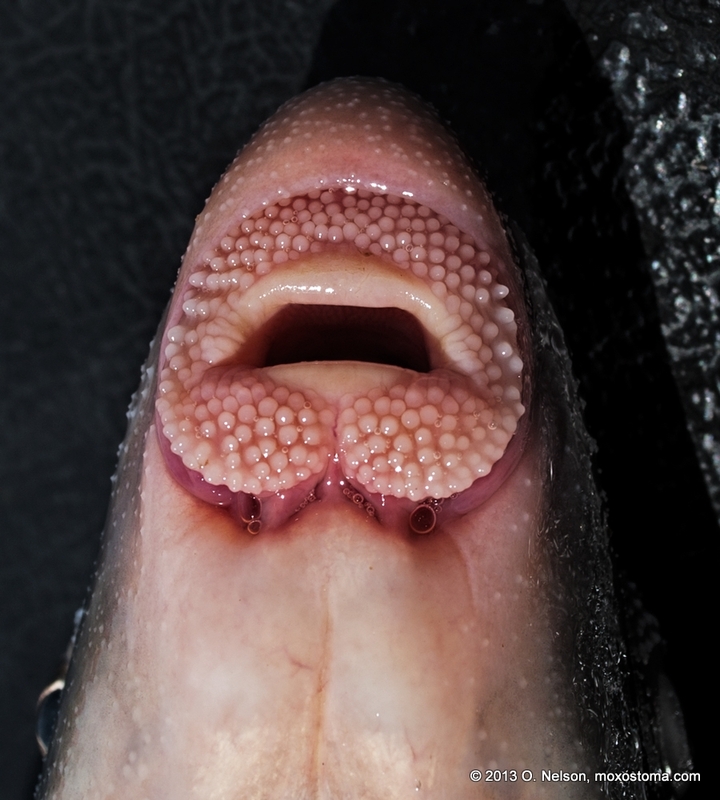 Shovelnose sturgeon, bottom view. Wisconsin River, May, 2013. Shovelnose sturgeon tail (with filament). Wisconsin River, May, 2013. River redhorse (Moxostoma carinatum). Wisconsin River, May, 2013. 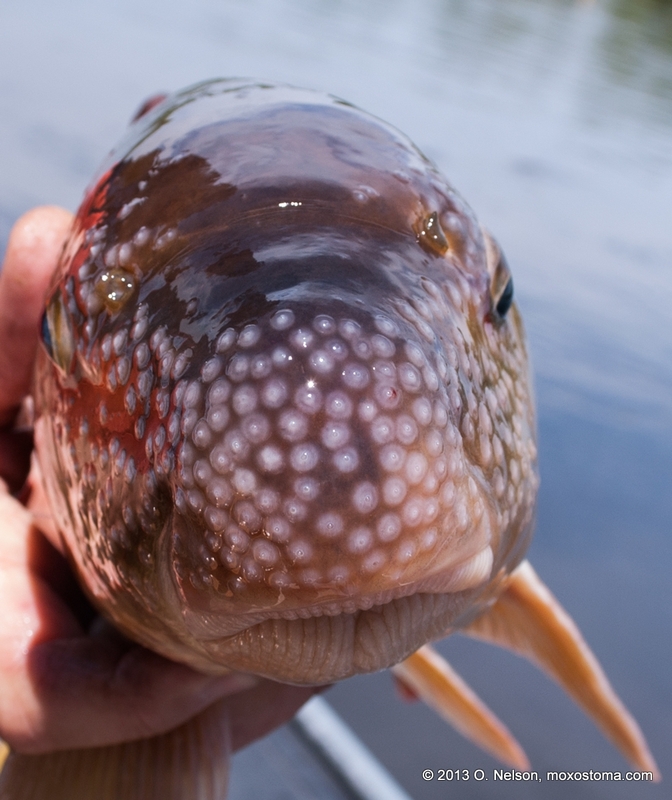 River redhorse (Moxostoma carinatum) all tubed up for the party. Wisconsin River, May, 2013. Tagged buffalo, carpsuckers, electrofishing, hogsucker, mooneye, photos, quillback, shorthead redhorse, smallmouth bass, suckers, walleye, wisconsin. Congratulations on such a cool opportunity, loved the photos! Awesome photos Olaf. I’ll probably be giving you a call soon to talk WI River fishing. We’ll have to get together for a few outings. Absolutely. You’re not wimping out on the contest again this year, are you? I caught 10 blue suckers in Kansas today. One weighing 8lbs and being nearly 30 inches. Wondering if it is normal to find blue suckers in Kansas or if this is some sort of accident. That’s a pretty amazing day of fishing. They’re native to Kansas, though like everywhere else they’re elusive. Congratulations! A good number of years ago I got into some very nice blue suckers in the St. Croix river below Taylors Falls.I caught a few on a white Mr Twister in the tailout of a swift deep hole. It is difficult to get to that spot unless the water is low. They jumped as many as five times as they were going away and were quite a load on light tackle! The others I caught were on leeches off a shelf and they too jumped numerous times. I got some good photos before I released these rare beauties! This is a great site for under appreciated fish! That’s amazing. I want to see those photos. Thanks! I’ve got the pictures but I can’t get them to you. do you have a way? Oh man, I fish this stretch all the time. Plenty of sturgeon and redhorse, but I’ve never seen a blue sucker here. Cool read, thanks for sharing!